His quest to sample authentic Indian regional cuisines in their original setting has taken Chef Thomas Zacharias places. Here he tells us what to try where—and why. Eat a dish in its hometown, advocates Chef Thomas Zacharias, executive chef-partner at the very popular Bombay Canteen in Mumbai. The food served at his restaurant is modern Indian, drawing heavily on India’s rich culinary legacy, but the recipes come from Thomas’s imagination and interpretation. 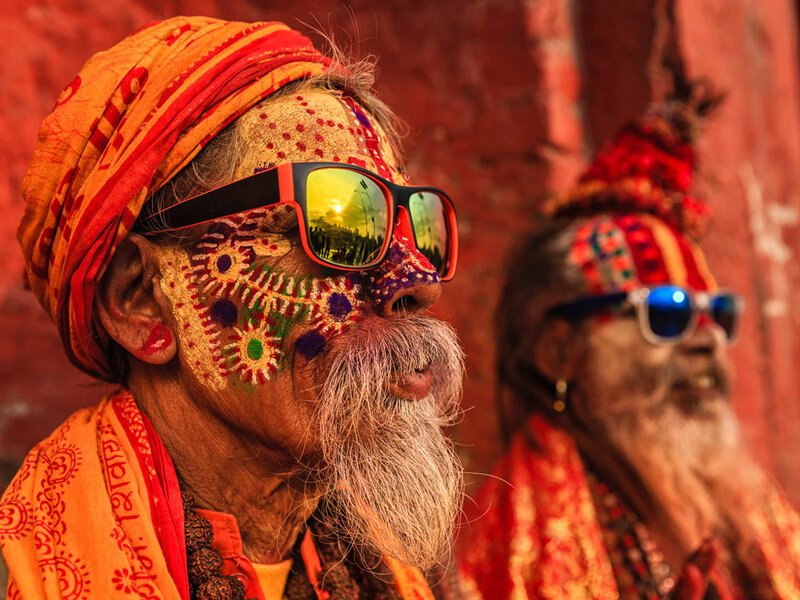 Over the past few years, he has travelled extensively across India—his most recent trip being to Kashmir—to meet locals and discover authentic, regional cuisine. On every trip, he tastes at least 25 to 30 new dishes, and has never come back to the kitchen uninspired. Clarity, he believes, comes from travel and curiosity. This list is a compilation of dishes that have stayed with him through the years, and you will most likely eat them at hole in the wall joints, street-side stalls and sometimes, in restaurants. 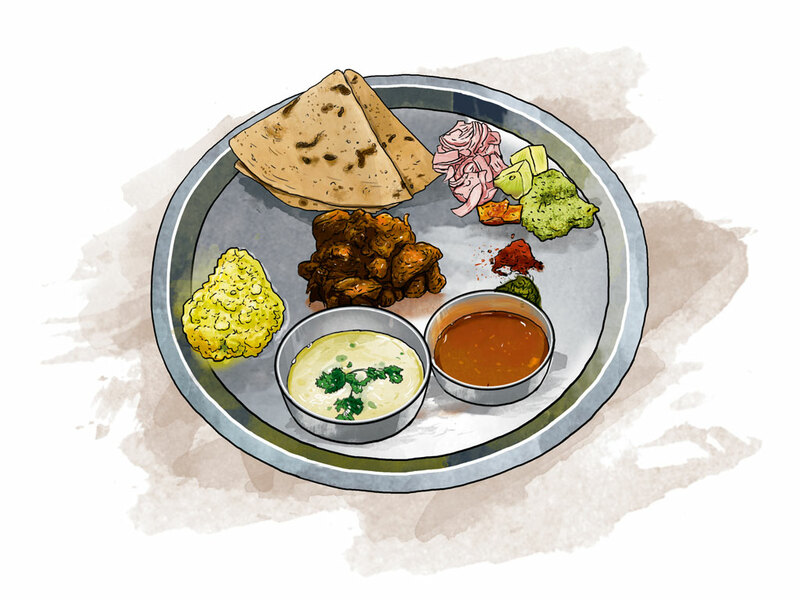 If his lucid descriptions aren’t enough, the accompanying food illustrations will definitely inspire you to make the journey, to sample a slice of India, one plate at a time. 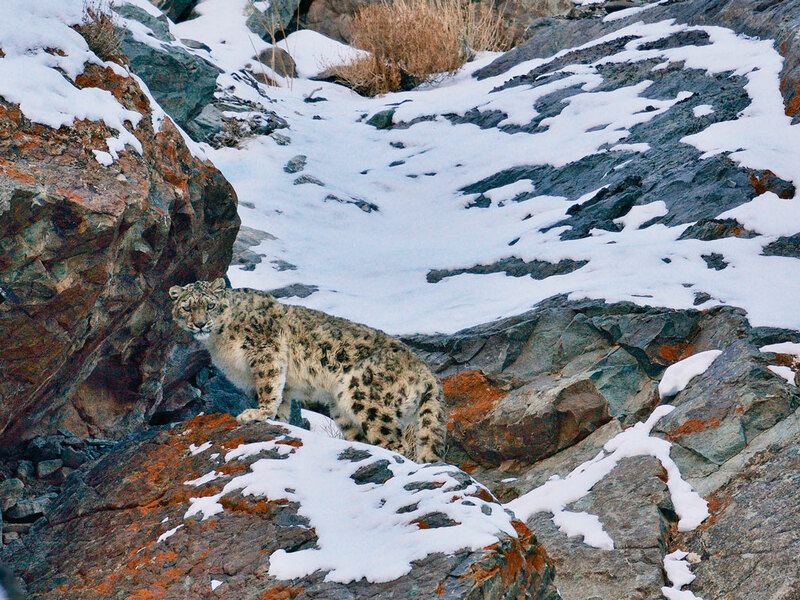 Kashmir’s ethereal beauty is usually more than enough to entice the intrepid traveller. But when combined with its extensive, complex cuisine, it is enough to make even the most jaded chef-traveller fall in love. 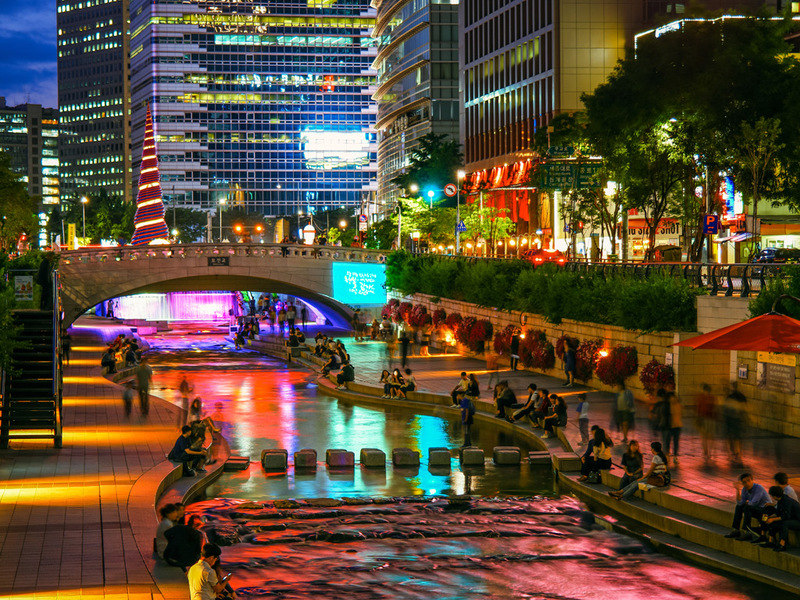 Thomas’s Instagram feed chronicles his utter delight at discovering the region’s gastronomy. When coaxed to pick a favourite, however, he couldn’t think beyond the gushtaba at Kareema, a tiny joint in Srinagar. 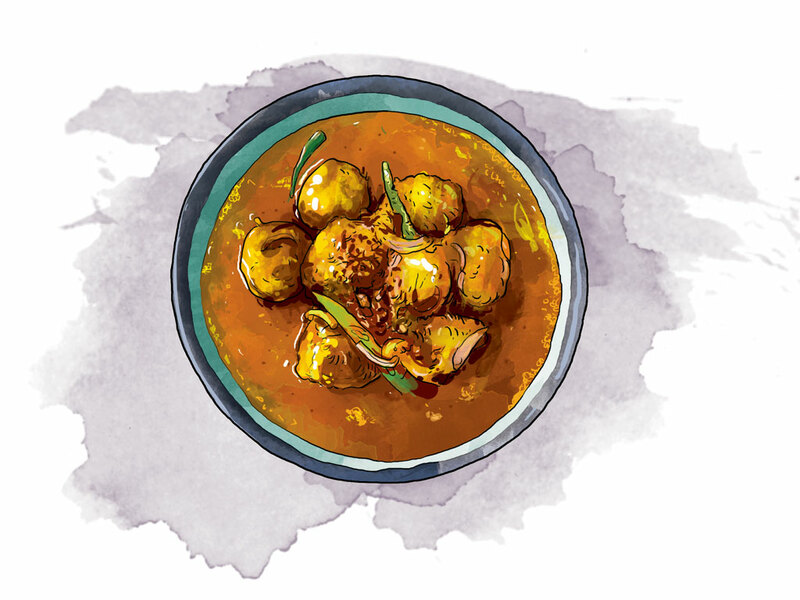 The spongy meatball curry is the last course of a Kashmiri wazwaan, a spread of over 15 dishes typically served during weddings and celebrations. The meatballs are made by pounding sheep meat, sheep fat, and black cardamom on a wooden chopping board until the fat emulsifies and the meat becomes a light pink colour. The creamy, slightly sour gravy is curd-based, and made with fennel seeds, dry ginger, and mustard oil—a fitting end to a kingly meal. 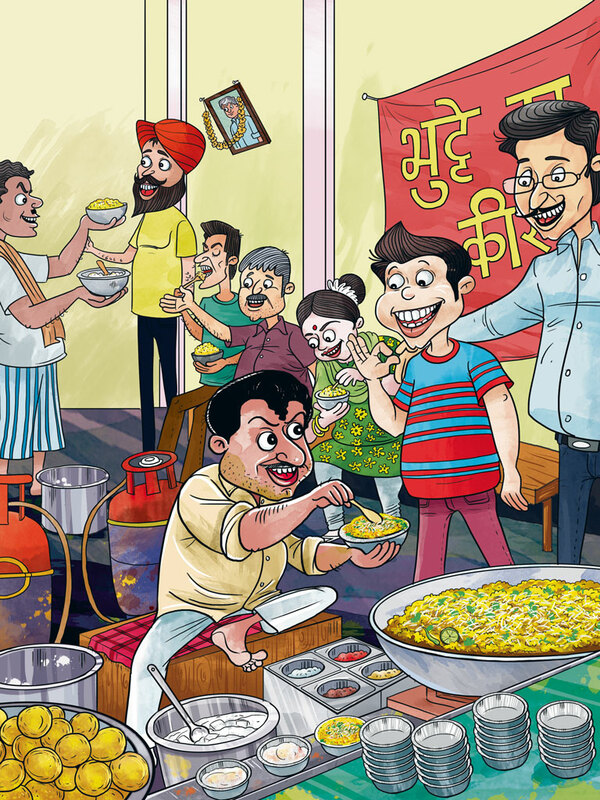 People typically come back from Lucknow with tales of tunday kebabs and biryani, but Thomas fell hard for an entirely unassuming dish—the warm and humble imarti. 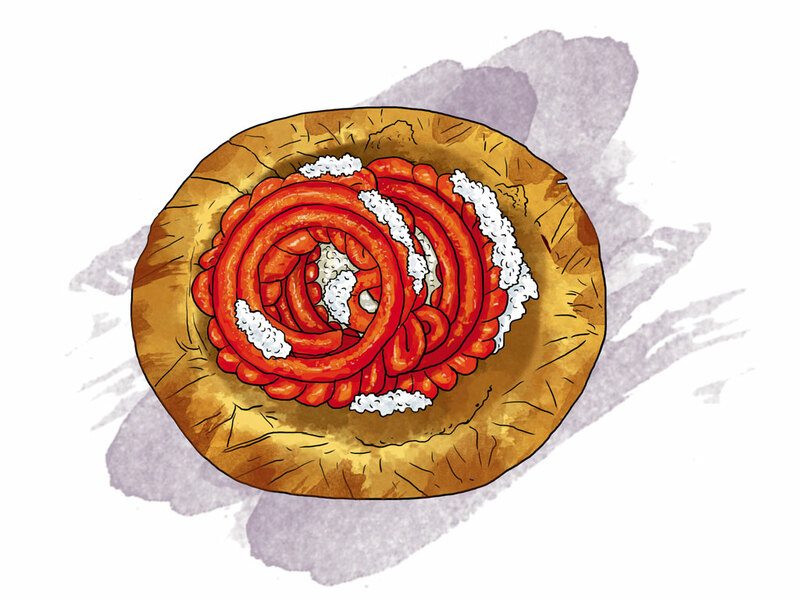 “The imarti is what every jalebi aspires to be when it grows up,” he says, laughing, when talking about the complexity involved in the making of an imarti. The orange sweet, made from urad dal, looks like jalebi but is defined by a ring of more intricate twists and swirls. Crispy on the outside and chewy inside, when eaten with chilled rabdi—the way it is served at Netram, an establishment dating back to the 1850s—it is pure decadence. Also, for vegetarians, this place is gold: the kachori served with galka (raw mango chutney) and simple puri-sabzi thalis here are to die for. While nothing compares to eating at a local’s home, the traditional Assamese thalis at Guwahati’s Gam’s Delicacy leave lasting impressions. 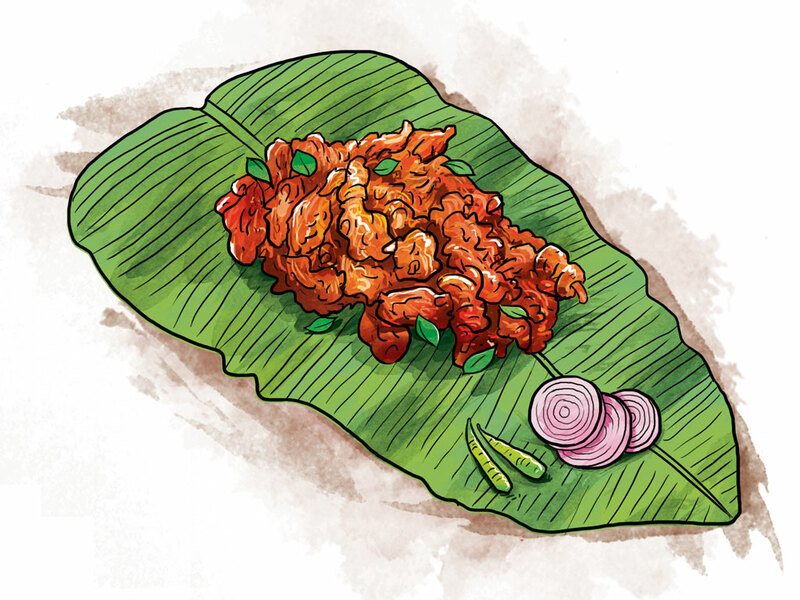 For Thomas, finding duck on the menu was like finding gold—he’d enjoyed a well-made plate of duck in few places outside his home-state, Kerala. 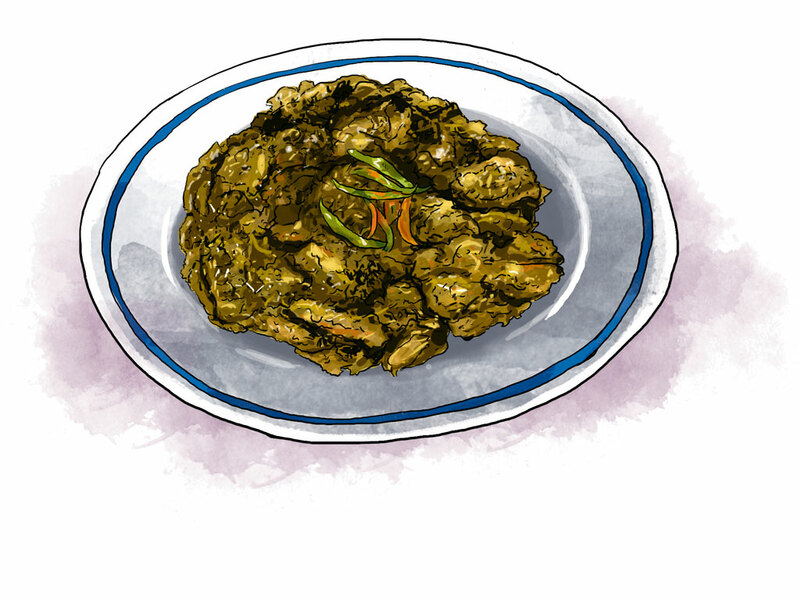 The curry, a comforting dish for Thomas, is cooked with black pepper, black sesame and garlic in mustard oil, and is naturally, black in colour. Order it alongside a thali, which includes regional delights such as the watery matti dal, kochu (mashed arbi leaves), banana flower sabzi, and potato bharta cooked in mustard oil, along with fish curry, and a raw papaya sabzi cooked with fish head. 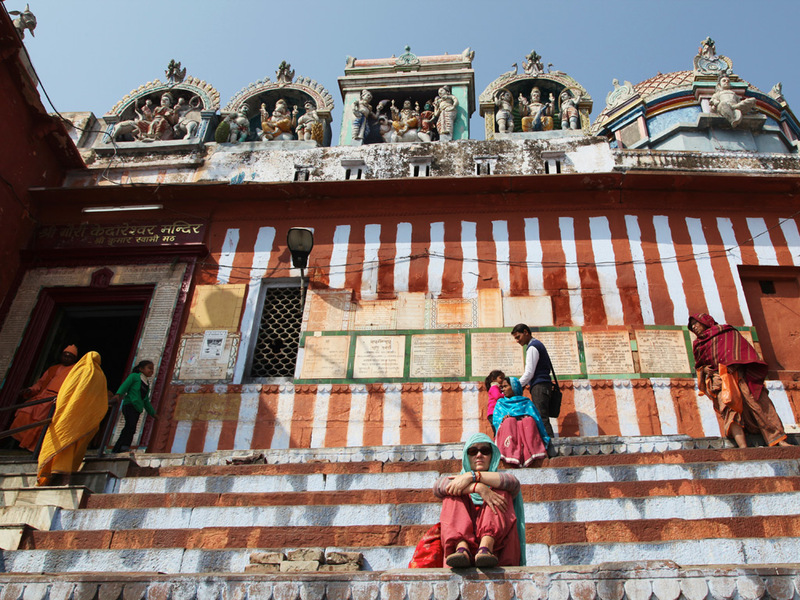 The food in Tuticorin, Tamil Nadu, is heavily influenced by the cuisine of nearby Sri Lanka. The spicy explosion that is chicken kothu parotta is soul food for late-night cravings. Deep-fried parottas broken into pieces are beaten together with leftover chicken curry, eggs, onions, cabbage, and green chillies on a hot giant tawa with a spatula. Each stall owner has his own rhythm for the beating; the sound attracts people as much as the aroma. The final product is scooped up and served in a banana leaf. The late-night street-food stalls, called nightclubs, look shady (think neon signboards with blown-up pictures of lips) but their messy kothu parotta is an unmissable treat. When at The Bombay Canteen, try Thomas’ version. 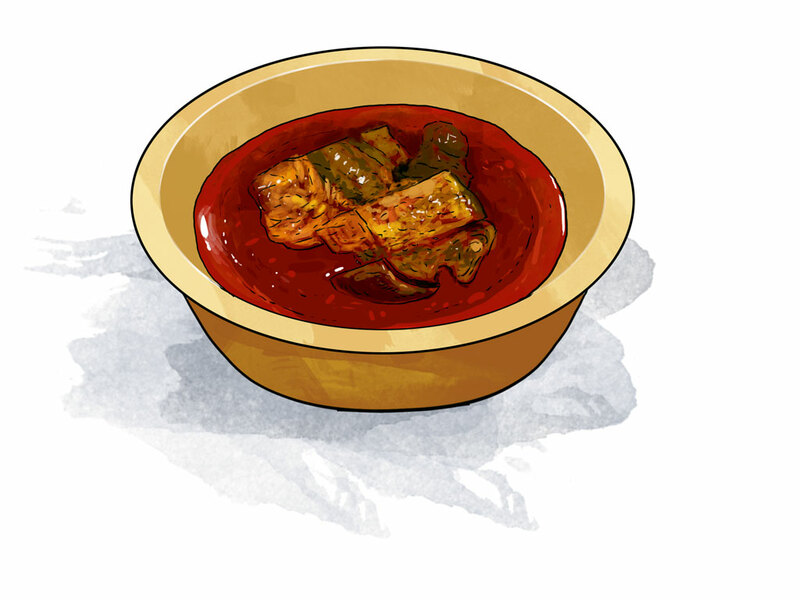 Fiery, in all likelihood, is the first word that comes to mind every time Kolhapuri cuisine is brought up; and that’s exactly why Thomas loves pandhra rassa. A deviation from the norm, this mellow warm mutton broth is traditionally served as a part of Kolhapuri thalis, and is the perfect way to undercut the spice levels in accompanying dishes like tambda rassa (a red chilli-based mutton broth). This coconut milk-based soup is cooked with mutton bones, giving it a gelatinous mouthfeel—the kind you’ll get while eating Mughlai paya (a trotter soup dish). At the 80-year old Hotel Padma, everything on the menu is excellent and well-balanced without being heavy-handed with chillies. But one spicy element you absolutely can’t miss here is the palate-scorching mutton lonche. The pickle is worth risking a runny nose for. A friend introduced Thomas to the wonders of bhutte ka kees. A single spoonful of the melt-in-the-mouth corn dish, eaten at his Mumbai restaurant, was enough for him to plan a trip to the street-food haven of Indore. He ended up at Joshi’s Dahi Vada House in Sarafa Bazaar, a local institution, where he finally tried the dish at its source. Grated corn is cooked with milk, hing, salt, green chillies, powdered turmeric and garam masala, until it assumes an oatmeal-like consistency. Served in a paper cup, it’s garnished with desiccated coconut, fresh coriander, jeeravan (a 27-spice mix with an umami flavour) and lime. 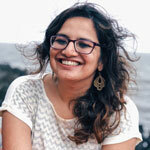 While you’re there, make sure you catch Joshiji beating the curd for dahi vada—better yet, make a Boomerang. His dramatic technique attracts people from far and wide. If Thomas was asked to pick between home-cooked food and restaurant meals, he’d always go with the former. Luckily, there are homestays to take care of that. Almost five years ago, at the Elephant Corridor Homestay in Coorg, host Nimmi Changapa made some kaadu manga (wild mango) curry for him, the taste of which still lingers fresh in his mouth. Cooked with Kodagu (Coorgi) wild mangoes, with the seed intact, this curry is typically eaten with rice. What makes it the delectable concoction it is are mustard seeds, green chillies, and a whole lot of jaggery. Despite being a local speciality, this is not a dish you get in most restaurants. If you need more convincing, the kaadu manga curry Thomas savoured at this homestay was delicious enough to make him forget all about the heavenly Coorgi pandi (pork) curry, the region’s legendary staple. Hyderabad is synonymous with haleem, and the dish even has its own GI tag. But like with most of his favourite food, Thomas likes to go back to its roots. Haleem originated in the Middle East and, in fact, has many versions across India, including the Kashmiri harissa and Bohri khichda. At Sarvi, a Hyderabadi institution, the rich porridge is printed as ‘Irani haleem’ on the menu. Though the haleem is similar to the versions served at other joints (meat and wheat taken in the traditional 2:1 ratio and slow-cooked for hours), Thomas prefers Sarvi’s for its balance of flavours and garnishes. They go beyond the traditional mint, fried onions and lime wedges to include cashew nuts, boiled eggs and even cream. Fun fact: Haleem consumption is at its peak during Ramadan, but Sarvi serves haleem all-year round. 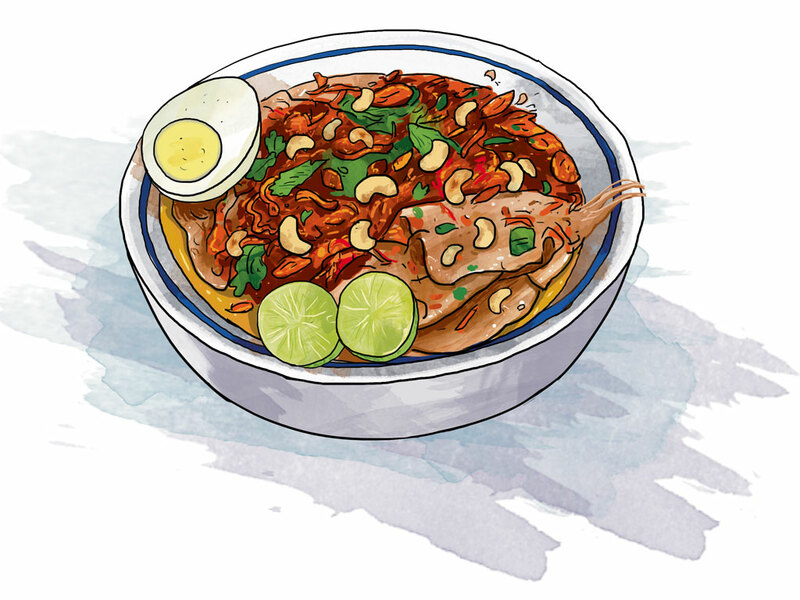 Northeast Indian flavours are vastly different, and Thomas first discovered them on a trip to Dimapur—thanks to his friend, Chef Joel Basumatari. The best food he sampled here came at Ethnic Table, a restaurant that serves traditional Sema Naga tribal food. Started by Aketoli Zhimomi, winner of the first season of Naga Chef, Ethnic rustles up delicacies featuring snails, frogs, pork, and axone (fermented soybean). But of all he savoured here, Thomas misses pork samthu the most. The thick curry is made with smoked, dried pork (pork boiled in salted water and dried over a fireplace), and has axone, red chilli, and ginger. Served with rice and akibiye (a bland side dish of yam boiled with seasonal, wild greens), the gravy has a strong umami flavour. So strong that Thomas hasn’t forgotten its taste in years. Kasturi, a small 40-seater Bengali establishment in Kolkata, is one of Thomas’s favourite restaurants in the country. The home-style food here is made with the catch of the day, and features seasonal fish and vegetables. There is also no fixed menu, and the day’s specials are displayed in steel platters by the wait staff. You can pick what you like. On one of his many visits here, Thomas tried the sheem pabda, a local freshwater fish (pabda) cooked with white flat beans (sheem). 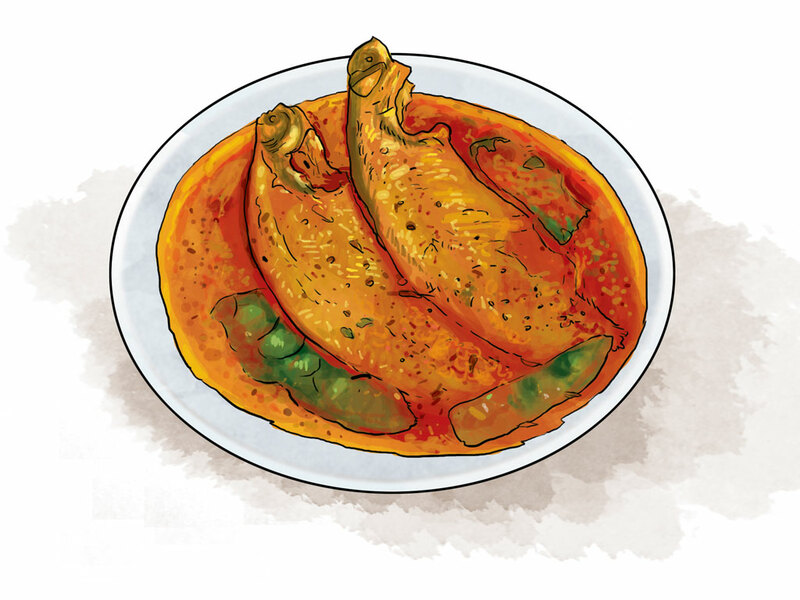 The mustard-based curry is cooked in mustard oil and tempered with poppy seeds, red chilli, and fresh coriander. Mildly spiced, the highlight of the preparation is that it keeps the sweet taste of the fish at the core. And that is precisely why Thomas loves the mouth-watering fare here. The dishes are delicately flavoured and each ingredient is a hero.